"The dream of youth. We remember it as a time of nightingales and valentines. But what are the facts? Maladjustment and idiocy and scenes of low-comedy disasters, that's what youth is. I don't see how anybody survives it." You've got to love Hollywood shorthand. Put dashing leading man Cary Grant in a pair of thick black glasses and�voilà!—he's your stereotypically absent-minded professor. Here, as Barnaby Fulton, he's on a quest for a youth formula—the prospect that has tantalized men of a certain age, from Ponce de Leon to Dorian Gray to Bob Dole shilling for Viagra—and he's got a laboratory full of scientists and monkeys to help the cause. Barnaby doesn't need to swallow his virility out of a Petri dish; just ask the missus, Edwina, played by Ginger Rogers. Their marriage is warm and funny and frankly sexual—they happily stay home from a dinner party for a little one-on-one time—and it's probably the best thing in this movie. The story, however, interferes. Grant cannot crack the code for this new wonder drug, but his boss, Oxly, is already preparing the ad campaign for it:"B-4: The Revival Vitamin." B-4. Before. Get it? (Oxly is played by Charles Coburn, who is terrific in movies like The Lady Eve, but doesn't get much more to do here than pant after Marilyn Monroe.) One of Grant's monkeys gets out of the cage, and instead of running for daylight, she sits down at the lab and mixes up the magic formula herself. It inadvertently ends up in the lab water cooler, though, so it's not Barnaby's potion that performs the alchemy, but the restoration of youth comes accidentally to whomever takes a drink at the cooler. Despite the strictures of the scientific method, Barnaby pulls a Dr. Jekyll and takes the potion himself; it of course doesn't work, but the water chaser he takes to wash it down does. As the first unintentional guinea pig, Barnaby's plunge back into youth manifests itself by his buying a brash sportscoat and a stylish, fast convertible, in which he drives Monroe around town at breakneck speed. The other characters remark that the potion has turned him back into a 20-year-old, but really, he's more juvenile than that, and becomes sort of a goofy idiot, enchanting Marilyn with pull-my-finger fart jokes and taking her roller skating. Does all this sound just hilarious? It doesn't to me, either. Given the level of talent on hand, in execution the final product here is a little dispiriting. The director (Howard Hawks) and leading man had teamed up previously for two of the all-time great screen comedies, Bringing Up Baby and His Girl Friday, so it's more than mildly disappointing to see that about the best that they can come up with here is monkeys swinging from light fixtures. (In this respect, it's one in a long line of primate comedies, including Bedtime for Bonzo, Every Which Way But Loose, and of course that Matt LeBlanc tour de force, Ed.) The screenwriting credits also tantalize with the hope of some bright comedy: the contributors to the script include I.A.L. Diamond, who went on to collaborate with Billy Wilder on such great screenplays as Some Like It Hot and The Apartment; and Ben Hecht, co-author of The Front Page, and the writer on Notorious. I don't know if it was a case of too many cooks, or catching good people off their game, but the work here isn't exactly first tier. Image Transfer Review: Some of the images are muddy, and the blacks can be indistinct. There are some strange lighting choices made, such as Ginger Rogers' imposing shadow over the stove as she fixes dinner; it's the kind of thing that you usually don't see in a comedy of the period. A few scratches and bits of debris interfere with the image periodically. Audio Transfer Review: Audio is adequate, with some crackling and other interference popping up on the soundtrack. Call me old-fashioned, but I almost prefer the mono mix on this one. Extras Review: The extremely brief featurette (00m:41s) is a restoration demonstration; compared to other features, this one didn't look so bad to begin with. The still gallery offers nineteen photos from the set, the best of which surely is Marilyn Monroe embracing a monkey. The original trailer is working hard selling it, but it's not quite convincing, proclaiming that "It's a four-alarm, four-star formula for fun!" 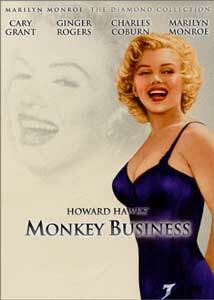 You might get sucked in by the roster of talent listed on the DVD case, but while Monkey Business may not be a total misfire, it is not in fact more fun than a barrel of monkeys. It's good for a few gentle yucks, and if you just can't get enough animal movies, there are some decent bits of simian physical comedy. On its own merits, though, the movie could have used some more anarchy and fun.